Moisture vapor tests are a critical component of any floor coating project but they are often not performed by many paint contractors or contractors that specialize in only doing floor coatings. This is a curious thing to me because the tests themselves are not expensive although the process can be time consuming and kind of a hassle so maybe that is why the test often gets blown off. 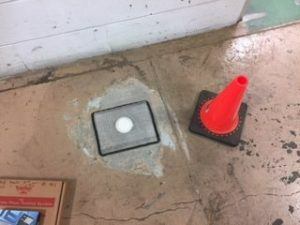 A moisture vapor test is where the amount of water vapor passing through a concrete floor is measured. If there is too much moisture passing through the floor the coating will fail. If the floor already has a coating on it and it is failing, it may be because of excessive moisture vapor. Moisture vapor tests are not difficult to do. They can be obtained at several different outlets like Amazon. Moisture vapor tests are all comprised of the same things. A calcium chloride “puck”, a ph test kit and a clear shield to place over and seal the test as it is being conducted. You will also need a gram scale. Once you have the test or tests the first step is to grind an area on the floor to be tested. You will want to grind away all existing coatings and get to the concrete. If there are no coatings, grind an area to insure a clean test. I normally grind an area the same size as the clear shield. For best results wait 24 hours after grinding before placing the test. Next step is to weigh the calcium chloride puck. Weigh it with the lid attached. You may notice the puck has the weight already written on it. Measure it just to be sure and record the result. Next step is to place the puck on the test area (without the lid on). Be careful to not spill any of the calcium chloride. Pull the tape backing off the shield and cover the test puck. Press down around the perimeter of the shield to make sure it is stuck well. 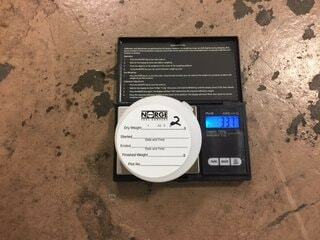 When I do moisture vapor tests, I wait 60 hours before reweighing the puck. The difference in weight is what you will use to determine the vapor pressure. The kits all have the formula you will use or there are many websites that you can plug the numbers into to get the results. The reason for running the test for a longer period of time, like 60 hours, is to get a good sampling of the moisture emission. All floor coatings have different limits for maximum vapor pressure and there are special primers that can be used when there are higher then anticipated numbers. If the number you get is below 4, you are good to go. Knowing what the moisture vapor pressure is will insure a successful floor coating. A /B = lbs of vapor pressure for 1000 sqft.